This big bustling market sells all the fruits, vegetables, seafood and Jabugo ham you need if you're self-catering in the Born. The building (1847) occupies the spot where the magnificent Gothic convent of Santa Caterina fell victim in 1835 to one of the city's first church-burning orgies. 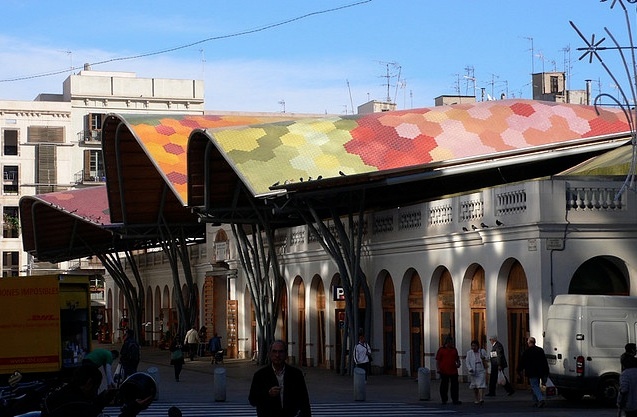 In 2005, the market re-opened, completely renovated according to plans by the late Enric Miralles (architect of the Scottish Parliament) and Benedetta Tagliabue—although the building's best feature, the huge waving roof covered with multi-coloured ceramic tiles is only visible to the passing pigeons, and the folks dwelling on the upper floors of the surrounding buildings.